RCMA Makeup 4 Color Kits are good for all occasions. Conveniently carry 4 shades at once! 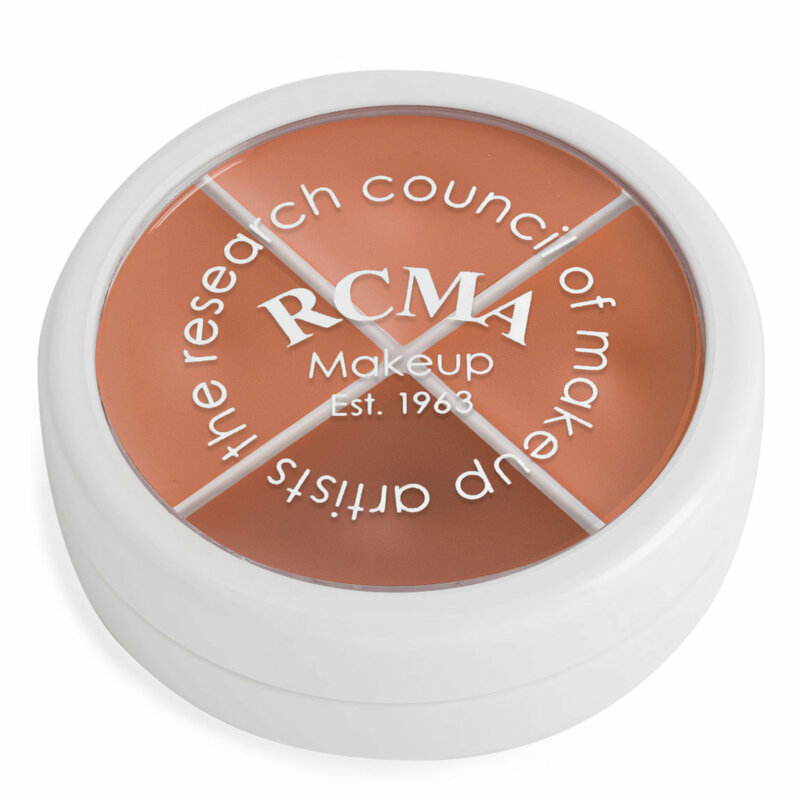 RCMA Color Process Shades offer a high degree of coverage on the skin, without the need to use too much. So a little, goes a long way! All four colors are perfect for my face. My skin looks amazing and I always get the most compliments when I use this foundation. I set it using RCMA no color powder and it doesn't dull the color at all. I have dry skin that tends to get dry patches and this doesn't stick to them or make my skin dry out over time. I use two of the colors as a regular foundation color, one to do a very natural highlight and the darkest to do a subtle contour. I've had this for months and have used almost every day and it is still pretty full because I can get the coverage I need from using very little. I'm am a cosmetic junkie. Now that it's out in the open? I'll tell you my honest opinion. RCMA I the most perfect foundation I've ever used. The combination of NO bad stuff ALL natural stuff and no animal testing is perfect for starters. It seems I've tried so many zillions of foundations in search of perfection. Perhaps this product, RCMA, is just that..perfect. Natural, no animal testing, sheer to opaque finish. What's not to love? I didn't need four colors. Maybe I was a bit too industrious in thinking I would use four different colors of this foundation. Maybe I thought I would need it for summertime? All I know is that the color that matches my skin has run out, and now I need more. I recommend buying some sample colors from another site, and then buy one whole compact of the same foundation shade. I do really like RCMA for the way in which is stays on, the high pigmentation that covers my "age spots" that used to be freckles. However, after trying all manner of primers, I still haven't found one I like, and my pores on the sides of my nose seem to look more obvious than I'd like them to. I also haven't found the perfect powder that both sets the foundation, and keeps control of the oily T-zone, and yet doesn't dry out the non-T-zone part of my face. This is the best makeup I have ever used. It goes on smooth and doesn't feel like you are wearing makeup. Great coverage. It looks good until you take it off. I have been using makeup for over 40 years and I think this is the last brand I will be buying. This is a professional product. I can use all four colors. Two are, my perfect foundation shade. The other two are a few shades to dark. Which makes them perfect, for contouring. I'm so glad I bought this product. great product !! it just amazing but shade is little strange. I mean ko2 bright more than ko1 and ko4 bright more than ko3 . is this normal arrange? or some mistake?? anyway I love this wheel highly recommend. Great product!! It's just amazing, but shade is a little strange. I mean ko2 bright more than ko1 and ko4 bright more than ko3 . Is this normal arrange? Or some mistake?? Anyway I love this wheel highly recommend. It is a great foundation that even the complexion with little product. It does not feel heavy, but i do notice that if i layer it to full coverage, it definitely will not as natural as second skin, which is actually not a big issue for me. However, i find it cannot control oil well like my other normal foundation, and I have combination skin, so I think people with oily skin still need a very great primer to control oil but not expect this foundation to be oil-controlling. Anyway, I love this product but will probably only purchase the one color process foundation because the darker color actually is not dark for me to do a contour I like. I'm very happy with this foundation. I used it on a client and it was a light weight texture and went on super smooth. The colors matched her skin perfectly. I have quite oily skin and live in humid hot area. I have a few foundations and most of them are not my perfect colour match as the skin below my neck is yellowish/sand while my face is few shades lighter with quite a lot redness (blushing so easily whenever I'm happy/exercising/excited) and it is very hard for me to find the perfect foundation without the fake procelain/IG face finish, especially when Summer started and I'm a bit tanned now. RCMA 4 Color Kit Foundation in A comes quite handy with its 4 shades in KO 1-4. I didn't choose Shinto because it is a bit too yellow even for my body. It turns out KO 4 is quite a perfect match for my skin tone at the moment. I do not prefer heavy makeup so 1 layer for full face and add more of the foundation to areas that need more coverage would be enough for me. It doesn't cover up all my redness but have it toned down and still looking natural. I set it with RCMA No Color Powder and still feel very light-weight. I didn't buy the RCMA thinner because I couldn't find it on Beautylish and I am glad I didn't find it. For my oily skin, the foundation goes on really smooth and nice with moisturizer(I use Embryolisse) already on.